Study suggests that messages from junk food ads are getting through. (HealthDay)—It's not how much time teens spend watching TV but how intensely they watch that adds on the pounds, new research suggests. The same engagement with video games or computers, however, wasn't related to weight gain, the researchers noted. "There is something unique about television and something unique about being engaged with television," said lead researcher David Bickham, a research scientist at the Center on Media and Child Health at Children's Hospital Boston. "The amount of attention that young people pay to television is a key link between media use and issues with weight," said Bickham, who also is an instructor in pediatrics at Harvard Medical School. One reason might be that there are lots of TV ads for sugary or fatty foods, which might shape young eating habits, Bickham said. "You would assume that the media showing those messages ... would be most effective in conveying those messages when the person that's watching it is actually paying attention," he said. In addition, TV promotes what Bickham calls "distracted eating," which is eating without being aware of how much one is eating. "Parents need to be aware not just how long their kids are using media, but how they are using it," Bickham said. To look at the effect of TV on gaining weight, Bickham's team recruited 91 teens aged 13 to 15. The teens noted their daily TV watching as well as how much time they spent on the computer or playing video games. In addition, they used a handheld computer to note what they were doing at random times and what they were paying attention to at that moment. Watching TV occupied much of the time, averaging more than three hours a day. Although time spent watching TV was not related to how much any child weighed, however, the amount of attention paid to TV was. There was no such correlation between weight and attention paid to video games or computers, the team noted. The study could only point to a correlation between TV viewing and weight gain in kids; it was not designed to prove cause-and-effect. 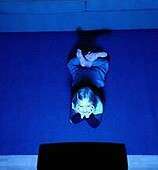 But one expert agreed that the intensity with which kids watch TV might be key to weight gain. "For too long we have talked about screen time as if it's all the same and haven't paid attention to content," said Dr. Dimitri Christakis, director of the Center for Child Health, Behavior and Development at Seattle Children's Research Institute. "Many of us have thought the linkage between TV and obesity isn't the sedentariness—after all, reading is sedentary and nobody has ever said reading leads to obesity—it's the advertising and the behaviors that go along with television screen time," said Christakis, who also is a professor of pediatrics at the University of Washington School of Medicine. Christakis advises parents to put their children on a "media diet." There are lots of shows without advertising, he said. In addition, parents can record programs and fast-forward through the commercials when they watch. They might even promote computer time or active video games as an alternative to TV. Christakis said public-service ads that promote healthy eating might help counter all the ads for fast food and sugary treats. Another expert applauded the study. "There has long been evidence of an association between screen time and weight gain," said Dr. David Katz, director of the Yale University Prevention Research Center. "This study parses that general field, and suggests that TV is the particular culprit. Further, just having a TV on in the background isn't the problem—the problem is actually watching the TV." Katz was more dubious about the lack of a link between weight gain and computers and video games. "This study suggests that other screen time may not contribute to obesity, but I'm not sure we can trust that," he said. "It's still possible that overall screen time is raising the average weight of our kids. Either way, we have cause to exercise better control over television food ads directed at our kids, and to encourage our kids to step away from their screens periodically and get some good old-fashioned exercise." The report was published April 8 in the online edition of the journal Pediatrics. More information: For more on childhood obesity, visit the U.S. Centers for Disease Control and Prevention.